As is the case with any other company, Square (NYSE:SQ) makes some decisions that pan out nicely… and some that end with less-than-thrilling results. By and large, though, the 450% gain SQ stock has logged over the course of the past couple of years says investors have liked what the company has done. A string of acquisitions appears to have paid off. If CEO Jack Dorsey was granted one do-over, though, it might be a rethink of the year-ago decision to offer bitcoin trading via its app. The cryptocurrency is currently down more than 75% from its December-2017 peak, with a big swath of that loss being suffered since early November — just when it looked like the digital currency was going to stabilize. It’s not the end of the world, to be clear. But it does beg the question of just how much Square had learned to rely on bitcoin-related revenue right as faith in the cryptocurrency was poised to plunge. It could have been worse. Square could have gone all-in on bitcoin, like e-commerce player Overstock.com (NASDAQ:OSTK) has — at the worst possible time. Overstock CEO Patrick Byrne has been a proponent (and investor) of bitcoin as far back as 2014, when it became another payment option at Overstock.com. But he upped the proverbial ante late last year when he launched a cryptocurrency trading platform called tZero. He was so convinced blockchain technologies were the future that, just a few days ago, Byrne confirmed that, by February, Overstock would be out of the e-commerce business via a sale of its retail operation. It’s all about crypto going forward, even if crypto’s future — even its survival — is in question. Square’s entry into the crypto arena has been much less splashy — though, given its newness, its bitcoin trading arm hasn’t exactly been modest. The graphic below puts things in perspective, breaking down where the company’s revenue came from last quarter, and how that compares to the year-ago breakdown. 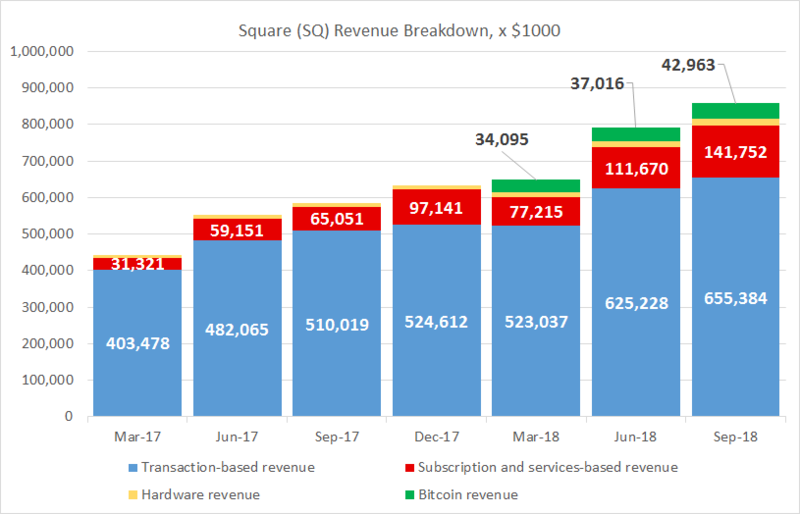 Bitcoin trading revenue, which didn’t exist at all a year ago, now accounts for about 5% of Square’s total top line. It’s arguably been a disappointing outcome for the company’s youngest venture, given the hype that’s surrounded bitcoin and other cryptoccurrencies for the past couple of years. In retrospect though, with interest and faith in bitcoin likely on the verge of collapse, SQ stock holders may be breathing a sigh of relief it didn’t get any bigger before the cryptocurrency faltered. There’s another nuance in the graphic, however, that more owners of Square stock owners should be celebrating, but aren’t. Its subscription and services-based revenues are growing nicely, now accounting for about one-fifth of its business. That’s up from about a tenth a year ago. Square’s subscription business is driven by platforms like food-ordering platform Caviar and website hosting subsidiary Weebly. The former was acquired earlier this year, and though Caviar itself was purchased back in 2014, the power of the platform is forever being bolstered. Square bought Zesty in April to bring a corporate-catering dimension to Caviar. 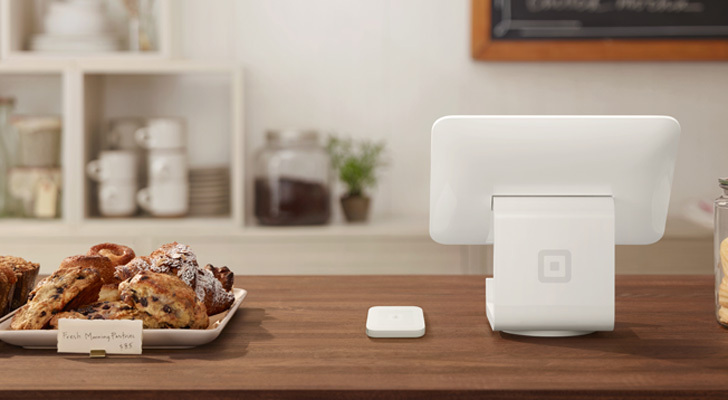 Those and other smaller deals are all being added to the mix in an effort to make Square a one-stop solutions provider for small business. And the strategy appears to be working. That unit is only going to get bigger and better. 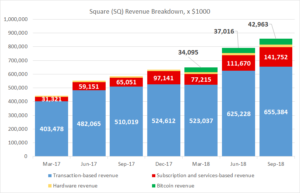 The company’s bread-and-butter business is still transactions, which makes up about three-fourths of Square’s total business. But the Paypal Holdings (NASDAQ:PYPL) acquisition of iZettle earlier this year poses a true threat to that piece of Square’s revenue pie — even if Square has a wide lead in that race. Small businesses aren’t afraid to try something else, and such competition will ultimately make the card-acceptance contest a price war. Investors will want to keep close tabs on Square’s transactional revenue as Paypal learns more about how to manage iZettle’s business. Yes, it matters. While Square has room to grow its transaction-based revenue, its days of red-hot growth are in the rearview mirror. That’s especially true now that Paypal is capable of taking dead aim at Square’s smartphone-as-a-card-reader business. Realistically speaking, Square’s big growth engine from here is likely to be subscriptions. It’s hardware and technological development from Square that will push customers into those recurring-revenue relationships though. As for bitcoin, it’s not dead in the water yet, but its future is anything but bright. In most regards it’s a blessing that business never really made a meaningful contribution to Square’s revenue mix, as it’s not apt to be any sort of growth driver in the foreseeable future. Article printed from InvestorPlace Media, https://investorplace.com/2018/12/whats-working-not-working-sq-stock/.